Which age group it is suited for? Are Razor Hovertrax 2.0 Safe? If finding the right hoverboard for yourself is driving you crazy and you are done comparing the features of hundreds of hoverboards, you just need to relax. We have brought to you one of the best technology hoverboards with excel quality standards and mesmerising features which will definitely take you high. Razor is one of the leading manufacturers of electric recreational products and now has become the top class electric scooter manufacturer over the past few years. If you see our article on top 10 hoverboards to buy in 2018, you will find the hovertrax sitting on the top of the list. We have prepared the list after an extensive research work, so you can well imagine what place these scooters hold in the world of hoverboards. We all love speed, right? Once you get on the board and learn to ride you will naturally want more and more of speed. Do you know at what speed rate you can ride in your hovertrax? 10 miles per hour is the maximum it can go. That’s one heck of a speed limit which makes it one of the fastest hoverboards available. Getting such a high speed with an ample of other features is like cherry on the top of the cake. Range is the distance it can go on without a pause in one full charge. It is different for different brands and most of them offer a range of 7-8 miles. But excitingly, hovertrax gives an exclusive range of 10 miles. So, you need not worry about recharging your battery after travelling every 3-4 miles. Want to know how long can your fully charged hoverboard ride non-stop? You may go on for like sixty minutes on your board without any issues. You can get these electric scooters in colours of your choice. You can easily get the blue and white variant of hovertrax 2.0 on most of the leading websites and also in the local markets. You certainly won’t want to wait hours for your electric scooter to recharge. You should not worry about this as well. Unlike other brands which might take up 6-7 hours for charging completely, hovertrax just refills itself in 2-3 hours. Now that appreciable! These boards being extremely light weighted and small in size are really portable. It weighs around 20 pounds. This means that you do not worry about how to carry it on for your next trip. All you require is a bagpack to lock up your treasure. Like most of the standard hoverboards in the market, they offer a maximum weight capacity of 220 pounds. This is fair enough for even a healthy man to take a smooth ride. This scooter comes with 350 watt dual motor which gives durability and the wide tires makes your riding experience even better. These function in two different modes including learning mode and normal mode. 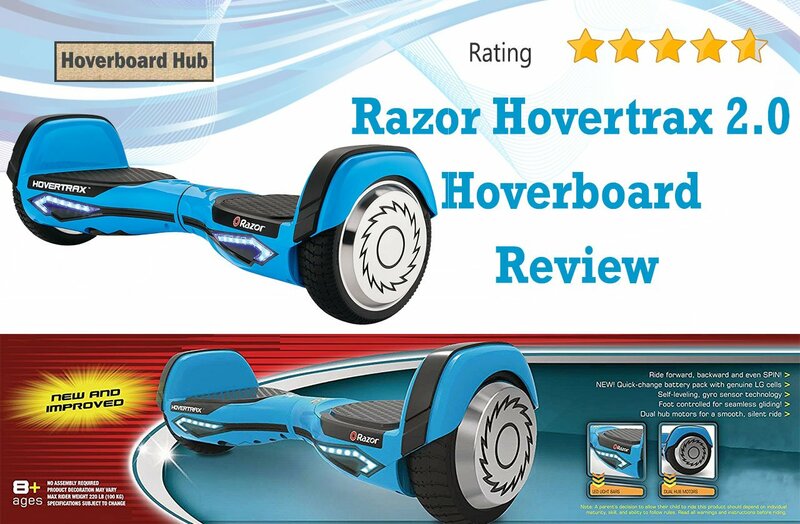 The Razor Hovertrax 2.0 is an exclusive hoverboard which comes in great batteries having excellent life time and quality. The working of your electric scooter will depend on the quality of the batteries used inside them. The stronger they are the better. It is mostly recommended to have batteries only produced by trusted manufacturers like L.G or Samsung. These are the top brands of batteries manufacturing unit which guarantees safety and quality. These have also been tested and proved efficient every time. You might wonder about the most striking feature of Razor Hovertrax 2.0 that is making it tough for its competitors out there. Well, it’s the unbeatable balancing feature of these scooters which has made it an amazing choice. The moment you step on the hoverboard, you will take almost no time to balance it. The Everbalance technology makes it easier to let you hold on to the scooter. So get ready for an ever smooth and electronic ride on the world’s best hoverboards. These hoverboards are equally good for your kids, for yourself or even your mom. Structured intelligently these scooters offer much reliability than any top class scooter in the market. Razor Hovertrax work great for all age groups. Well, these hoverboards are 100% safe. Whether you are racing outdoors or commuting or riding just for fun, these are always reliable. Razor Hovertrax 2.0 is a product of a renowned manufacturer Razor from the US. These are UL 2272 certified and gives surety of its safety and quality. Gone are the days you needed to worry about the sparkling or fire issues. You can be sure of them being fire resistant. All these features you are getting in a single scooter, isn’t it worth it? The speed is good, the range is great, and it is light, stylish, reliable and smart. It is good for riding on all kinds of terrains. And how much all these cost? A very decent price of $400 makes it an incredibly beautiful choice. So now you will believe on why we have rated it on the top of the list. The reviews we have collected so far have been phenomenal. The only feature you will not find in these boards is Bluetooth. However, apart from that, it is the best hoverboard and we are sure you will love it.